Several well-established music festivals call Atlanta home including SweetWater 420 Fest, Atlanta Jazz Festival and Music Midtown. In recent years, the city has welcomed new brands like A3C Hip-Hop Festival, Imagine Music Festival and Shaky Knees Festival. 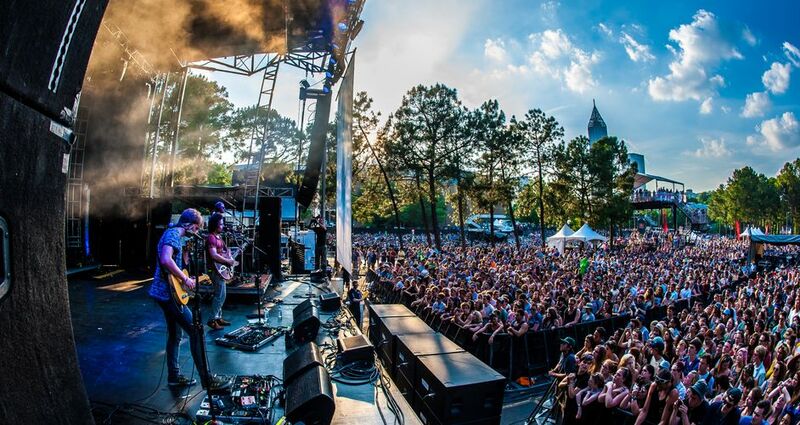 Shaky Knees launched in 2012 and the rock festival has since gained a large fan base in Atlanta and beyond. This year’s Shaky Knees Festival will take place at Centennial Olympic Park and International Plaza from May 13-15 with headlining performances from Florence + The Machine, My Morning Jacket and Jane’s Addiction. More than 70 acts are scheduled to perform on five different stages named after iconic Atlanta streets such as Peachtree, Ponce de Leon, Boulevard, Piedmont and Buford Highway. Festivalgoers will have a diverse array of food options within the park grounds. There will be 22 food and drink vendors with food trucks and stalls. Atlanta favorites Fox Bros. Bar-B-Q, Grindhouse Killer Burgers, The Fry Guy, King of Pops and more will serve hungry patrons throughout the weekend. This year, Sweetwood is also introducing a new festival to the music scene called Shaky Beats. Shaky Beats Music Festival will take place May 20-22 at Centennial Olympic Park with headliners Odesza, Major Lazer and Big Gigantic. The festival has more than 40 performances lined up across three stages.